A debate among local historians in San Bernardino Valley has gone on for a number of years about whether not Mission San Gabriel had another asistencia at its Rancho San Bernardino. This would have been in addition to its long time asistencia at what is now familiarly called the Old Plaza Church in Los Angeles. Opposing views about the status of San Bernardino's mission chapel heated up in the 1920's during a restoration effort. Another round of discussion was opened in the 1970's and continued for more than a decade. In a sense, the first round ended in a victory for the asistencia status which was believed to be the Franciscan intent before the 1834 secularization of the missions. The second round ended with a grudging concession that the disputed chapel was really an estancia during its existence, with the possibility of becoming an asistencia or even a full mission if the mission system had continued. The change of mind was not due to the uncovering of evidence, for the same body of evidence provided the intellectual platform regardless of era. The difference was somewhat due to interpretation but also was linked to a political agenda in the first round which was absent in the second. George Beattie, a retired school superintendent in San Bernardino, believed in the 1920's that an injustice been done regarding the history and remains of a Catholic mission outpost established three decades before the city was founded by the Mormons in 1851. He noted that the original coastal missions had been or would be restored. He was particularly perturbed that Mission San Luis Rey's St. Anthony Asistencia at Pala was likewise restored after the great 1899 earthquake, but no money or effort had been expended since the Mormon regime to restore the San Gabriel outpost in his city. Likewise, no tourist publications mentioned San Bernardino as they all did for Pala. He began calling the colonial-era ruins an asistencia, realizing that he would not be able to raise funds for restoring a structure of lesser status. Through a friend, he persuaded the AAA to include an article in its periodical about a San Bernardino "Asistencia," even calling it "The Last Mission." All of his own writing used the term, "asistencia," even though he had no proof. In one periodical, he traced what he referred to as "Spanish Plans for an Inland Chain of Missions." After a good start in writing about Pala's Asistencia, he unabashedly used the same approach for San Bernardino. Here again he was stymied by not finding the key word in any Franciscan document for San Gabriel. The problem was deftly sidestepped by inserting the word "asistencia" in parentheses on the assumption that the original author meant to say it but somehow failed to do so. To bolster his assumption, Beattie wrote to Fr. Zephyrin Engelhardt. The father of mission history denied such an interpretation. He defined an asistencia as "a mission on a small scale with all the requisites for a mission, and with Divine service held regularly on days of obligation, except that it lacked a resident priest." 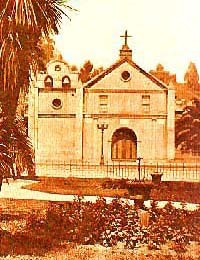 Since the Plaza Church fitted the definition, the two assigned priests at San Gabriel had all they could do to administer a mission and its western asistencia. They lacked the time to administer similarly to an eastern asistencia as a "submission" (Engelhardt's term). Beattie was disappointed but continued to press his fundraising campaign despite the lack of solid historical foundation. He was successful in that endeavor, and the heap of adobe ruins was eventually transformed into the appearance of an asistencia. This was done by borrowing heavily from Pala's architecture, especially that of the chapel building. The original rancho layout was considerably altered. Fr. Engelhardt died in 1934, and no other voice was raised against upgrading an estancia, whether by word or deed. As researchers in the 1970's went beyond home mission environs to the role of mission outposts, it became more apparent that something of a hierarchy existed of considerable extent. Once past provision of a rude ranch chapel, various gradations led to a sitio such as that of San Jacinto and a number of identified estancias such as San Bernardino. The prime mover in this effort was Msgr. Francis Weber, archivist of the Los Angeles Archdiocese. By the late 1980's, he and others, by analyzing the same material used by Beattie, were able to publish books and monographs attesting to the true historical status of San Bernardino in the mission system. This interpretation was eventually accepted by the museum and historical communities in San Bernardino Valley. Weber, Msgr. Francis J., ed. "EL CAMINITO REAL: A DOCUMENTARY OF CALIFORNIA ESTANCIAS"
"DID MISSION SAN GABRIEL HAVE TWO ASISTENCIAS? THE CASE OF RANCHO SAN BERNARDINO"
"RESTORATION OF THE SAN BERNARDINO ASISTENCIA"
"LAST OF THE MISSIONS: THE SAGA OF THE SAN BERNARDINO ASISTENCIA OF MISSION SAN GABRIEL NOW BEING RESTORED"
Nuestra Senora la Reina de Los Angeles.